I would not recommend this restaurant, very poor service, waiters seem to move fast but never to serve you. We went there to have family dinner but evening was spoiled by restaurant's poor service, noone cared to serve us, no napkins or cutlery on the table, order was mixed up and forgotten. Had to keep on asking waiters to check on our order for food and drinks. Very bad experience, complete chaos. Food was ok, on par with other restaurants in the area. Would not go there again. If you hate your hard earned money and wants to get insulted and pay someone for that then only go to this restaurant. This is a worst customer experience you will have in your life. waiters , managers will treat you like that you are there to eat for free. One of the worst experiences in a restaurant I have ever had. Not only was the food terrible and ill portioned, it came after ordering twice and an hour and a half's wait. IT came with a side order of rude customer service from the staff too. I was particularly surprised by this, not only because this was a highly recommended restaurant a few years ago, but also because we were in a party of 20 people. I'll let you do the math on how much we spent if the average meal was £20-25. Half the food arrived at one point and the other half of the food was arrived 30 minutes after. We had to get many portions re-heated. This did not go down well with the staff, unsurprisingly. After finishing our birthday meal, we wanted the bill. After contesting that we were overcharged. We quietly argued our point through the ranks of the restaurant until we met the manager. This did not go down well because he swore at us, attacked our integrity by making very serious accusations about some of the party's members. Not only this but he did not seem to care if the disagreement became violent. At this point we found the best way to leave the debate (as crowds were forming at the bus stop outside and it was attracting too much attention) and we left imminently. I most certainly will not be returning to this restaurant, and because of the hostile experience, I will think twice before even going to a restaurant on Edgware road. 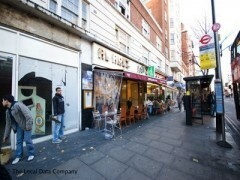 Lebanese restaurants in Knightsbridge are probably a little more expensive but worth the assurance. I will be arranging events there from now on. Note: If you see this message again on some other review websites, I am only re-affirming my point and not spamming. I am a business analyst so I am not competition. The quality of the food at Al-Arz is good and always had a great team of waiters working on the customers orders in a neat and polite fashion, however, lately, the service has declined to a point where the waiter forgets my orders and brings me different food and doesn't expect a complaint about it and if I did, I would be treated like I begged for the food rather than paid. In addition, many waiters indulge in flirting with females in the shop forgetting other customers waiting to be served. Most irritably, the lack of "thank you" when you pay the bill at the till. The food, service, ambience and atmosphere at Arez all great. I really enjoy the friendly environment and their freshly prepared dishes, especially the grilled meats at which the Lebanese are experts. They also serve a lovely breakfast, so well worth a visit with very reasonable prices.